Brampton, Ont. 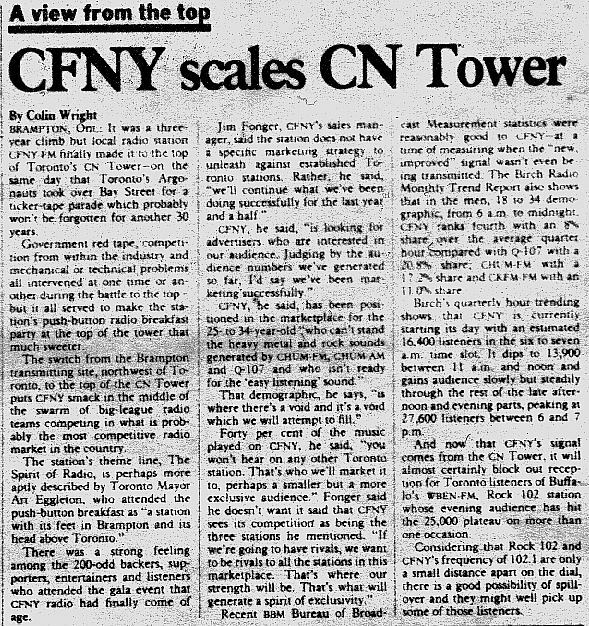 : It was a three-year climb but local radio station CFNY-FM finally made it to the top of Toronto's CN Tower - on the same day that Toronto's Argonauts took over Bay Street for a ticker-tape parade which probably won't be forgotten for another 30 years. Government red tape, competition from within the industry and mechanical or technical problems all intervened at one time or another during the battle to the top - but it all served to make the station's push-button radio breakfast party at the top of the tower that much sweeter. The switch from the Brampton transmitting site, northwest of Toronto, to the top of the CN Tower puts CFNY smack in the middle of the swarm of big-league radio teams competing in what is probably the most competitive radio market in the country. The station's theme line, The Spirit of Radio, is perhaps more aptly described by Toronto Mayor Art Eggleton, who attended the push-button breakfast as "a station with its feet in Brampton and its head above Toronto." There was a strong feeling among the 200-odd backers, supporters, entertainers and listeners who attended the gala event that CFNY radio had finally come of age. Jim Fonger, CFNY's sales manager, said the station does not have a specific marketing strategy to unleash against established Toronto stations. Rather, he said, "we'll continue what we've been doing successfully for the last year and a half." CFNY, he said, "is looking for advertisers who are interested in our audience. Judging by the audience numbers we've generated so far, I'd say we've been marketing successfully." CFNY, he said, has been positioned in the marketplace for the 25- to 34-year-old "who can't stand the heavy metal and rock sounds generated by CHUM-FM, CHUM AM and Q-107 and who isn't ready for the 'easy listening' sound." That demographic, he says, "is where there's a void and it's a void which we will attempt to fill. Forty percent of the music on CFNY, he said, "you won't hear on any other Toronto station. That's who we'll market it to, perhaps a smaller but a more exclusive audience." Fonger said he doesn't want it said that CFNY sees its competition as being the three stations he mentioned. "If we're going to have rivals, we want to be rivals to all the stations in this marketplace. That's where our strength will be. That's what will generate a spirit of exclusivity." Recent BBM Bureau of Broadcast Measurement statistics were reasonably good to CFNY - at a time of measuring with the "new, improved" signal wasn't even being transmitted. The Birch Radio Monthly Trend Report also shows that in the men, 18 to 34 demographic, from 6 a.m. to midnight, CFNY ranks fourth with an 8% share over the average quarter hour compared with Q-107 with a 10.8% share, CHUM-FM with a 17.2% share and CKFM-FM with an 11.0% share. Birch's quarterly hour trending shows that CFNY is currently starting its day with an estimated 16,400 listeners in the six to seven a.m. time slot. It dips to 13,900 between 11 a.m. and noon and gains audience slowly but steadily through the rest of the late afternoon and evening parts, peaking at 27,600 listeners between 6 and 7 p.m.
And now that CFNY's signal comes from the CN Tower, it will almost certainly block out reception for Toronto listeners of Buffalo's WBEN-FM, Rock 102 station whose evening audience has hit the 25,000 plateau on more than one occasion. Considering that Rock 102 and CFNY's frequency are only a small distance apart on the dial, there is a good possibility of spill-over and the might well pick up some of those listeners.